Secures and safeguards your property by providing up to 400 cycles or up to 97 days of standby power when the power is down. Securely control and monitor your Gate Operator from anywhere and get activity notifications through the MyQ® app. 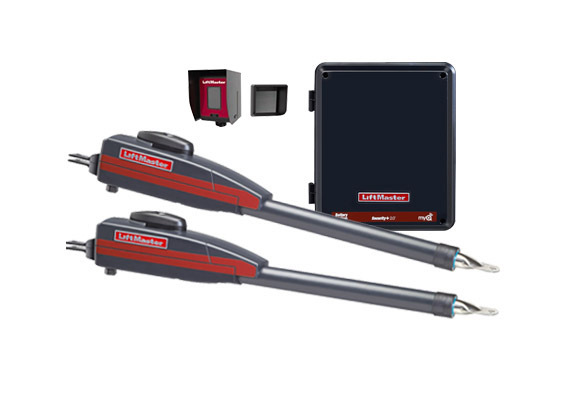 LiftMaster has designed its own purpose built motor to meet the exact requirements needed to open and close your gate. POWER 24VDC or solar power. 120/230V Single Phase (Standard control box). MONITORED SAFETY INPUTS 3 Main Board, 3 Optional Expansion Board. TEMPERATURE SPECIFICATIONS -4°F (-20°C) to 140°F (60°C). GATE TRAVEL SPEED 90-degree opening in 15-17 seconds. P3 MOTOR® 24VDC continuous-duty motor. OPERATOR DUTY RATING 100 cycles per day. WORM GEAR REDUCTION Precision machined all-metal gear drive. OPERATOR WEIGHT Actuator arm 19 lbs. Standard control box 13 lbs.